One of the stories I loved the most while I was reading the innovator's dilemma book, was the story of Honda and how they entered the American market and as promised in my previous post I would like to summarise it in this post. During Japan's years of post-war reconstruction and poverty, Honda had emerged as a supplier of small motorized bycicles that were used by distributors and retailers in congested urban areas. Honda developed considerable expertise in making efficient engines for those bikes and as a result its sales increased in the Japanese market. Honda's head management team was eager to exploit the company's low labor costs to export motorbikes to North America, however there was no such a market there for its main product the Supercub. Market research showed that at that time Americans were more interested in motorcycles for long distance driving in which size, power, and speed were the most highly valued product attributes. Honda engineers designed a fast, powerful motorcycle specifically for the American market and in 1959 dispatched three employees to Los Angeles to open market. To save living expenses the three shared an apartment and each brought with him a Supercub bike to move around the city. The venture was a frustrating experience, Honda's product offered no advantage to customers other than cost, and most manufacturers refused to accept the unproven product line. When they managed to sell a few hundred units the results were disastrous. Honda's understanding of engine design turned out not to be transferable to highway applications and as a result, the engines sprung oil leaks and the clutches wore out. Honda's expenses in air-freighting the warrantied replacement motorcycles between Japan and Los Angeles nearly sunk the company. Meanwhile in Los Angeles, Kihachiro Kawashima the Honda executive in charge of the venture decided to vent his frustrations by taking his Supercub into the hills east of Los Angeles. It helped he felt better after zipping around the dirt and invited his two colleagues to join him. Their neighbours and some people in that area started to inquire where could they buy the bikes they were using. This private user of what became to be known as off-road bikes continued for a couple of years. At one point a Sears buyer tried to order Supercubs for the company's outdoor power equipment departments buy Honda ignored this opportunity preferring to focus on selling large, powerful, over-the-road cycles, a strategy that continued to be unsuccessful. Finally, as more and more people clamored for their own Supercub to join the dirt-biking friends, the potential for a very different market dawned on Honda's US. team. It wasn't without discussing and pushing that the managed to convince the managers in Japan and start shifting their focus on a completely different market. Honda persuaded a few sporting goods dealers to take on its line of motorbikes, and they began to promote the bikes successfully. Honda had no money for a sophisticated advertising campaign. But a UCLA student who had gone dirt-biking with his friends came up with the advertising slogan. 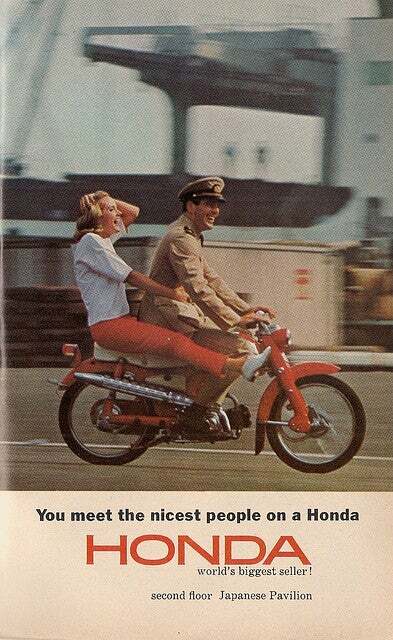 "You meet the nicest people on a Honda" for a paper he wrote in an advertising course. Encouraged by his teacher he sold the idea to an advertising agency, which then convinced Honda to use it in what became an award-winning advertising campaign. Honda's 50CC motorbike was a disruptive technology in the North American market. From its low cost-manufacturing base for reliable motorbikes, Honda turned its sights upmarket, introducing between 1970 and 1988 a series of bikes with progressively more powerful engines. Even when Honda entered the market with the wrong foot, its venture team was determined enough to change their managers' minds and focus on a completely different market, a market that was non-existent at that time in Nort America. That helped by well designed and reliable engine and a fantastic advertising campaign, change the fate of Honda and marked the beginning of a very successful era in the North American market. In this case a good product combined with a bit of luck in the finding of the perfect marketing campaign were key, we have seen many products that even being better were kicked out just because the marketing campaigns was terrible and the audience they were targeting was the wrong one, I still remember the VHS vs Beta war. This blog post reminded me of this awesome song that I hope you enjoy :).